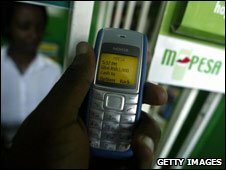 Millions of Africans are using mobile phones to pay bills, move cash and buy basic everyday items. So why has a form of banking that has proved a dead duck in the West been such a hit across the continent? It has been estimated that there are a billion people around the world who lack a bank account but own a mobile. Africa has the fastest-growing mobile phone market in the world and most of the operators are local firms. In countries like South Africa, for example, mobile phones outnumber fixed lines by eight to one. In Kenya there were just 15,000 handsets in use a decade ago. Now that number tops 15 million. Setting up a bank account on your phone is straightforward. All you do is register with an approved agent, provide your phone, along with an ID card, and then deposit some cash onto your account. You can use it to pay for everything from beer to cattle - one Masai farmer told the BBC that when he sells cows in Nairobi, he puts the money on his phone to ensure that robbers can't get his cash. A Kenyan woman said she uses the technology to transfer money from her phone to that of her parents while a Nairobi businessman told us it was handy for settling customer accounts. 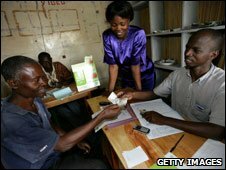 In Tanzania just 5% of the population have bank accounts. In Ethiopia there is one bank for every 100,000 people. Even Africans with bank accounts often face high charges for moving their cash around. It is this gap in the market that mobile phone banking is targeting. While the amounts of cash being transferred are often tiny, the sheer volume of business compensates for that, as Pauline Vaughan, head of Kenya's biggest mobile phone banking service M-Pesa, explains. "We have over seven million customers who have registered for M-Pesa.... Our average transaction is actually less than $40 [£24] - this is the kind of customer we are addressing," she says. "But in total we are moving in excess of $8.5m per day." However, the mobile phone revolution continues to leave large parts of the continent behind. While countries like Kenya, South Africa and much of North Africa are approaching 100% mobile penetration, in Burundi, the Central African Republic, Eritrea, and Rwanda it is less than 30%. Low incomes, illiteracy and large signal black spots are all obstacles to the sale and use of mobile phones. Taxes, which can be as high as 30% in countries like Tanzania and Uganda, are also a disincentive. Telecoms experts say that many African markets remain too risky for mobile phone companies, which have targeted more stable and wealthy countries first. "What we have seen is cherry-picking in markets like South Africa and much of Francophone North Africa," says Nigel Hawkins, an independent industry analyst. "There are concerns [in other countries] about the cost of building infrastructure; there are worries about the non-payment of debt and unstable governments." Mobile phone banking is, however, attracting charitable backing. 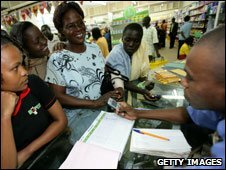 The Bill and Melinda Gates Foundation plans to put $12.5m into a programme to extend services to the poor. But those companies with a firm foothold in their home markets are increasingly looking to expand. With the market in Kenya largely sewn up, M-Pesa is now eyeing neighbouring Tanzania and even Afghanistan. South Africa's MTN recently announced plans for a fully-fledged bank account on mobile phones, with an optional credit card. The service will be extended to the 20 countries where MTN operates, including Uganda, Nigeria, Cameroon and Ivory Coast, which combined have over 90 million mobile phone users. Africa Business Report, BBC World News - Saturday, 22 August 0130 GMT and 2230 GMT; Sunday, 23 August, 1330 GMT and 2030 GMT.